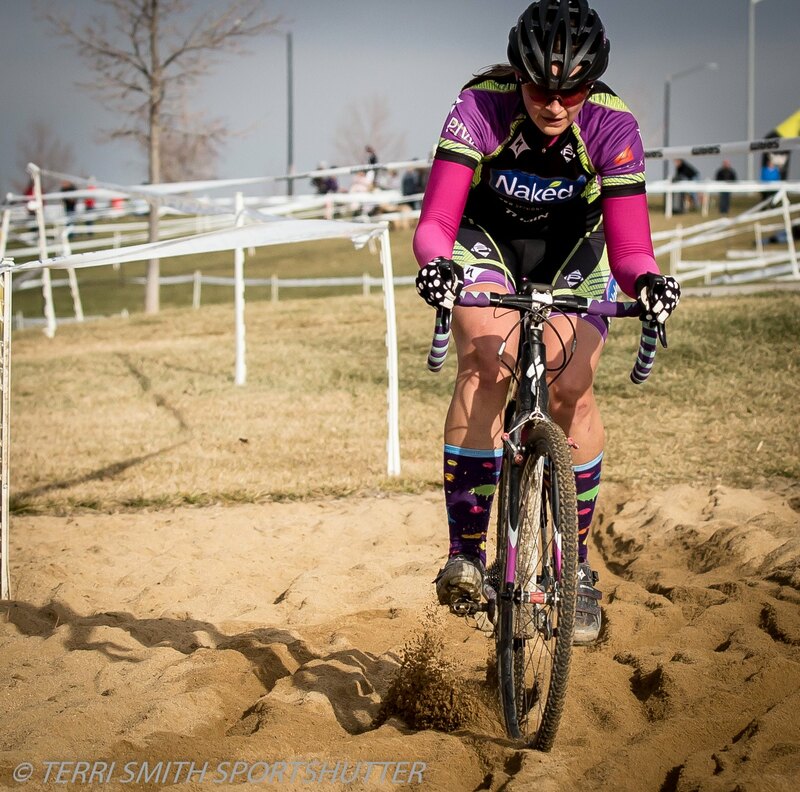 I have a funny habit of pulling my cyclocross season together at the last minute. It happened last year when I had super good races at states in December, and then at Altitude Adjustment Cross and Nationals in early January. I even managed to finally run and remount a bike, with a stutter step, at the last minute last year. I have a feeling this year is going down the same path. The regional championships were held on the same course as Altitude Adjustment, which was my first, and so far only, BRAC/USAC cross podium. So I was hopeful in that aspect, except of course it was all dry and all that evil grass was there in all it’s evil power sucking glory. Temperatures were in the mid-40s, which luckily is in the zone where I am good at riding, especially racing, a bike. Someone told me at the starting line it’s because I’m from the arctic. Ha! I gave the course a pre-ride in the meager winterish clothes I scrounged up out of my bag in the car (it’s been warmer in Cheyenne the past few races so I’ve under packed). Surprisingly, the grass on the course rolled decently well, though I could tell it was tough. There were several drops off curbs so I decided to run a smidge over 40psi vs the 30 psi I had in my tires to reduce the chance of pinch flatting (I gave up long ago bringing a pit bike). The grass wasn’t too bumpy which was nice, but as if grass isn’t bad enough, bumpy grass is the worse. At the start I took off fast, and maintained it. Usually my body explodes. But I was in a decent position, and definitely not off at the back, like nearly all the starts I’ve had this year. First lap I was always in a mix of people, I hadn’t been dropped! Second lap Michelle came around me on the finishing straight, but on the dirt single track climb I surged around her mostly out of excitement to have a chance to do that at a race! I was still in a group of people! Third lap… still in a group of people. By then something insane was happening. I WAS REMOUNTING PROPERLY. No stutter step! Like all pro up in here! I don’t know how it happened… Elizabeth was being my vocal cheerleader, telling me to go “get those girls” and as I ran over the barriers I just flew back on the bike. At first, mid-air, I thought it was about to go terribly wrong and then I realized I actually remounted properly and it felt so good! Funny how it’s way faster than that “hobble-hobble-stutter-stutter-okkk maybe I’ll go now….ugh swing my leg over” thing I’ve been doing for a year. Unfortunately on an uphill switchback on the third lap I fell over. I can’t tell you what happened because I don’t know what happened. NO NO NO NONONONONONO NOOOOOOOOO! I lost contact with Marian and Katie. Suddenly the air came out of my balloon. I remounted and fumbled and walked through the double sand pit. Then dammit, I knew I had to try again. I knew Maureen, and perhaps others, were still behind me, and I hadn’t been caught by the Cat 4’s yet (whoa!). So away I went! Fourth lap continued to go well, remounting like a pro. I was getting a tiny bit more comfortable cornering on the pavement at 15-20mph. My legs were screaming but I kept telling myself to go faster so I could get to some barriers so I could remount. Because I was way too amused by remounting my bike now! I stayed close to the 3 or 4 Cat 4’s that did catch me and Marian was always there, but just out of my grasp. So yeah, one race to go, and I pulled it together. I never thought I’d like the course when its not snow covered, but apparently it played to some strengths of mine! There’s no place to recover more than a second or two, which also usually isn’t a course for me, but it all clicked today! I don’t know if I already saw the effects of fat biking+one week of training, or what…. But damn, that was fun! Hard and fun! I was also pleased to see consistency in my lap times… usually my first lap is fast and I quickly get slower and slower. They were nicely clustered at: 8:21, 8:03, 8:20, 8:20, and 8:28. Beast mode on second lap, and even on that third lap with a fall and walking through the sand it wasn’t my slowest lap! There were about 5 or 6 of us all within 2 minutes which is also nice to see. Always a dejected feeling when I’m minutes and minutes behind the rest of the gals, so being in the mix was refreshing and gave me some nice motivation for states next weekend! Next postYes, I needed a stinkin’ fat bike!